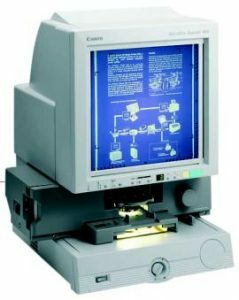 We have a range of microfilm scanners available to digitise existing microfilm images and convert them into industry standard tiff images. These images can be stored (and easily backed up for security purposes) on a local PC or on a company server. Images can easily be distributed around a network very cost effectively via email as an attachment. We can accommodate microfilm in all formats including Fiche, Jackets, Aperture cards, Cartridge or 16mm & 35mm Open spool rolls. Also we offer additional film carriers, to automatically scan one image after another which will increase productivity and reduce time consuming manual intervention by operators. Finally, we can convert your scanned images to word searchable PDF’s to improve information retrieval. No need for costly microfilm cabinet storage or microfilm reader printers and their upkeep. Secure electronic back up of deteriorating microfilm information for disaster recovery purposes. We can collect your microfilm and provide a secure conversion to a digital media on your behalf. Previously inefficient and difficult to access microfilmed records can be returned to you on a digital media like CD, DVD, Memory stick etc. Our specialist support staff can also provide technical assistance to upload your scanned microfilm images straight to your document management system or network server. Please leave us your details below, along with a brief description of your enquiry.